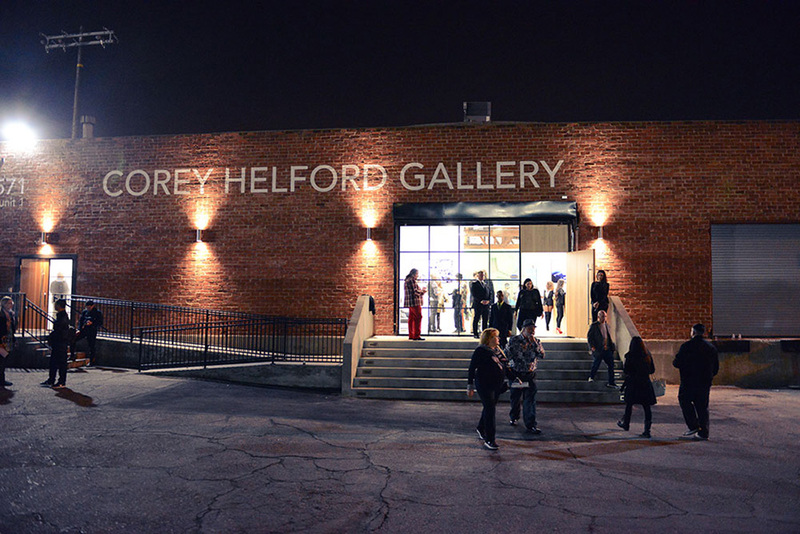 The Corey Helford Gallery held the Charity by Numbers – Artists Color Outside the Lines exhibition for The Alliance for Children’s Rights from the 10th to the 17th February 2007. The week-long show included 117 paint-by-number canvases which have been modified, reimagined or in some other way altered by local and international artists. The exhibition also included a successful week-long online auction on eBay to benefit the charity. 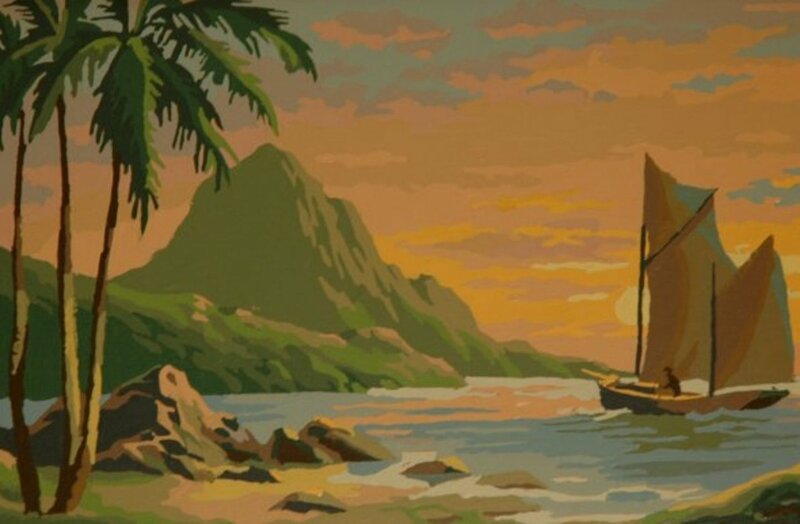 The framed paintings were accompanied by a photograph of the original paint-by-numbers canvas. 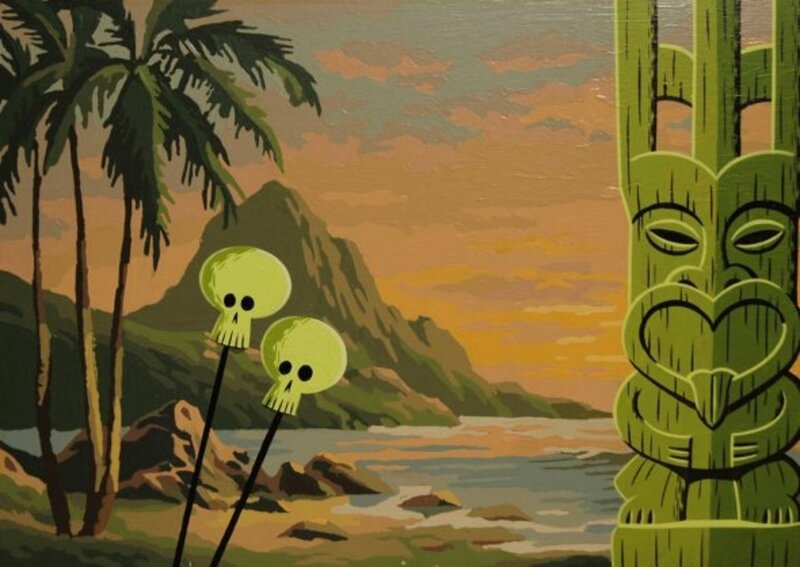 Shag modified a simple 14” by 10” tropical scene by the addition of a green tiki and a pair of skulls on poles (possibly a Skorch lamp). The Clowns! group show ran from the 15th to the 29th November 2008. 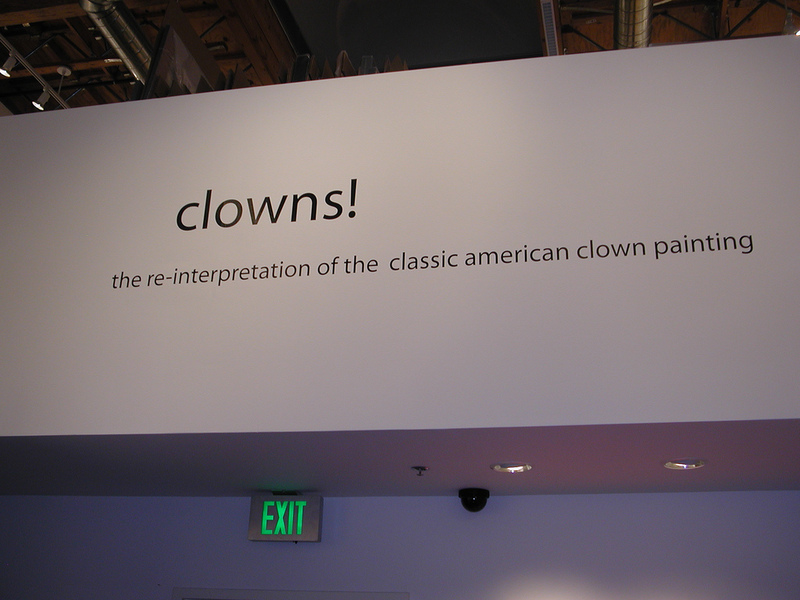 The show was a re-interpretation of the classic American clown painting and included forty-three original paintings including one, slightly scarey one, by Josh Agle. The acrylic on panel painting, Old Decadent Clown, was sized 24″ by 19″ and cost $10,500. 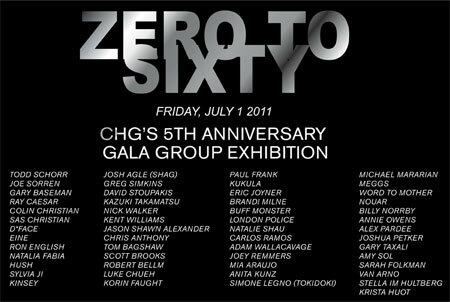 Jan and Bruce Helford celebrated their gallery’s fifth anniversary with a group show from the 1st to the 13th July 2011. 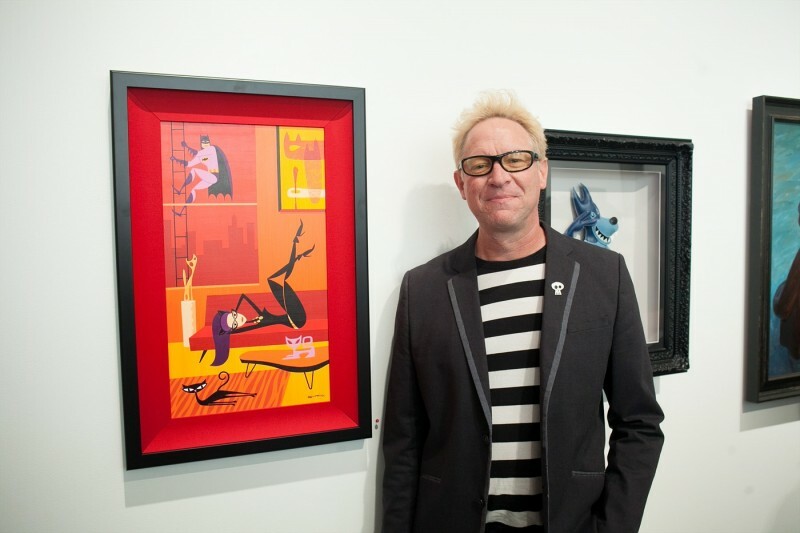 The Zero to Sixty: Five Year Anniversary Gala Group Exhibition included fifty-three pieces from a diverse set of artists including Josh Agle who submitted the acrylic on panel original painting Ketamine (sized 33” by 24”, cost $12,000 USD). CHG marked the arrival of summer in 2012 with the Motion: The Art of Movement exhibition which ran from the 9th to the 30th June. The show included over twenty-five artists from the new contemporary art scene and depicted dynamic movement in people, design or nature. 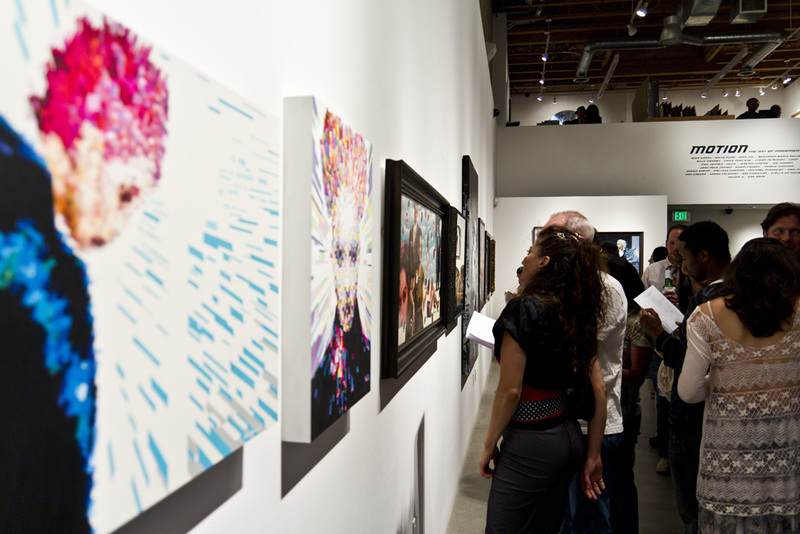 Each piece captures a different aspect of movement, creating an intensely vital and energized multi-artist exploration. 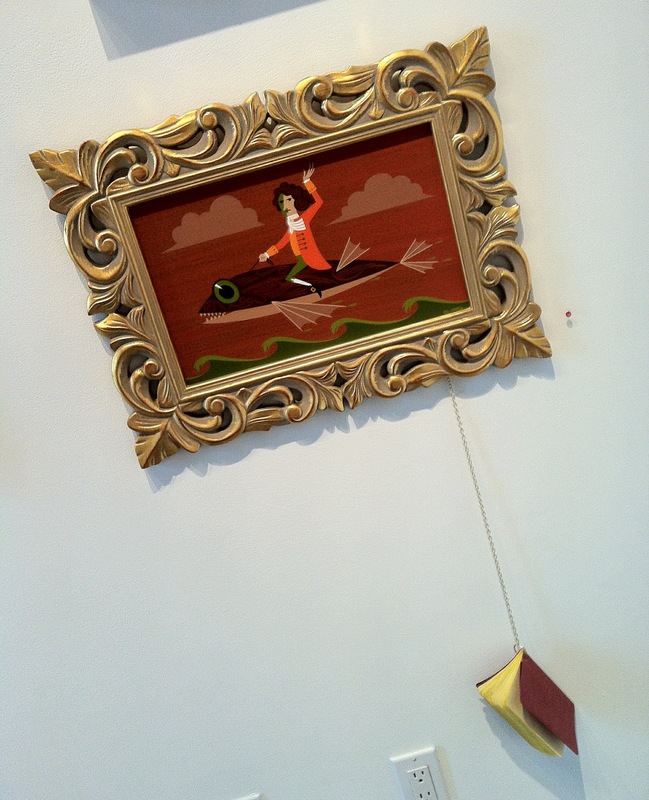 Shag contributed the acrylic on panel painting, Sir Issac Newton discovers the First Law of Motion while straddling a Flying Fish (sized 16” by 10”, cost $5,000 USD). 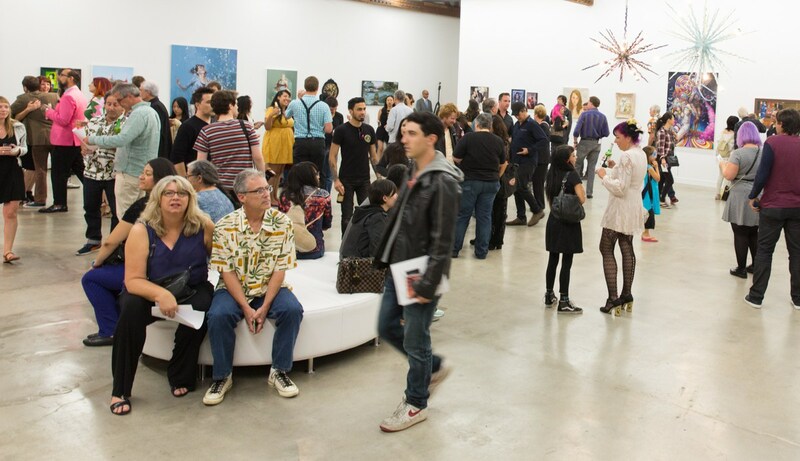 In 2013, CHG held their inaugural show aimed at increasing the number of art collectors. 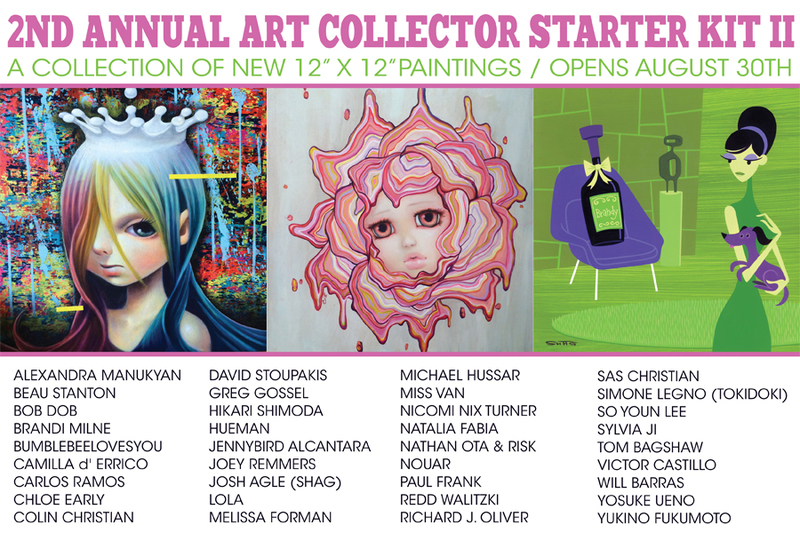 Artists created 12” by 12” works for the Art Collector Starter Kit Group Show, selling for lower-than-normal prices. The exhibition ran from 23rd March to the 1st April and Shag showed the picture The Favorite New Song (sized 12” by 12”, cost $4,000 USD). 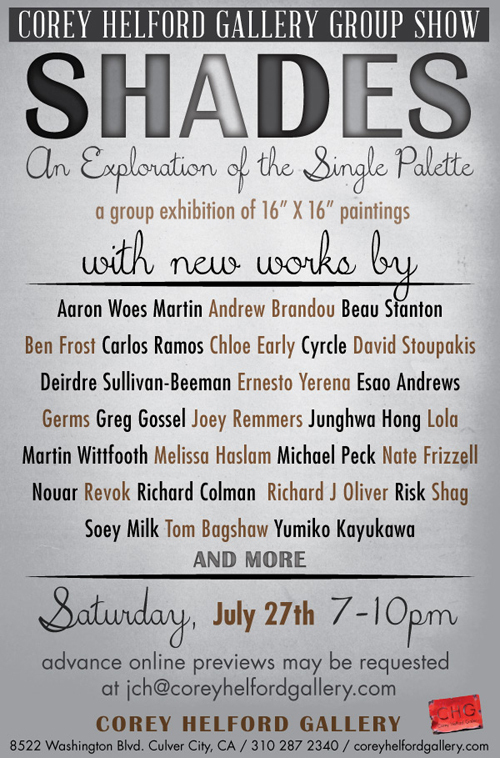 The Shades: An Exploration of the Single Palette exhibition opened on July 27th, 2013, and continued to August 7th. The international gathering of top artists from the new contemporary art scene “explore the boundless emotion and subtlety expressed in the use of shades of only one single color palette”. 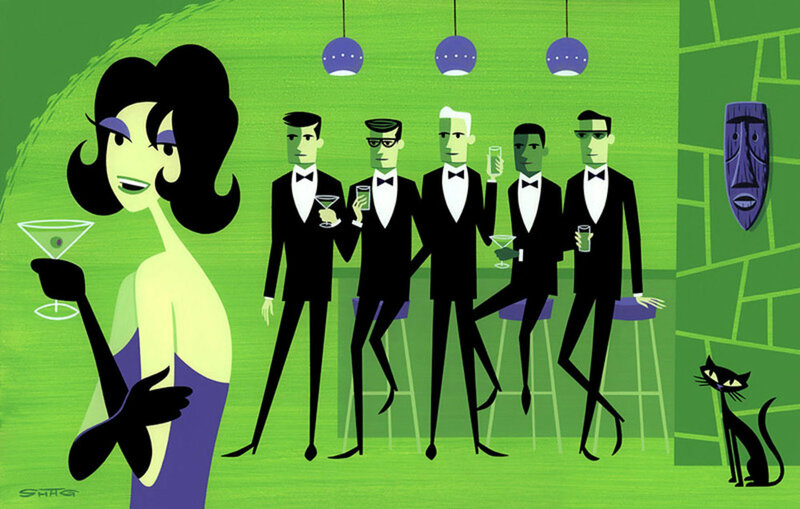 Josh Agle contributed the acrylic on panel painting The Flare Up (sized 16” by 16”, cost $7,500 USD). The drinking vessel strongly resembles the 108oz Kelena Volcano Bowl set as manufactured by Tiki Farm. 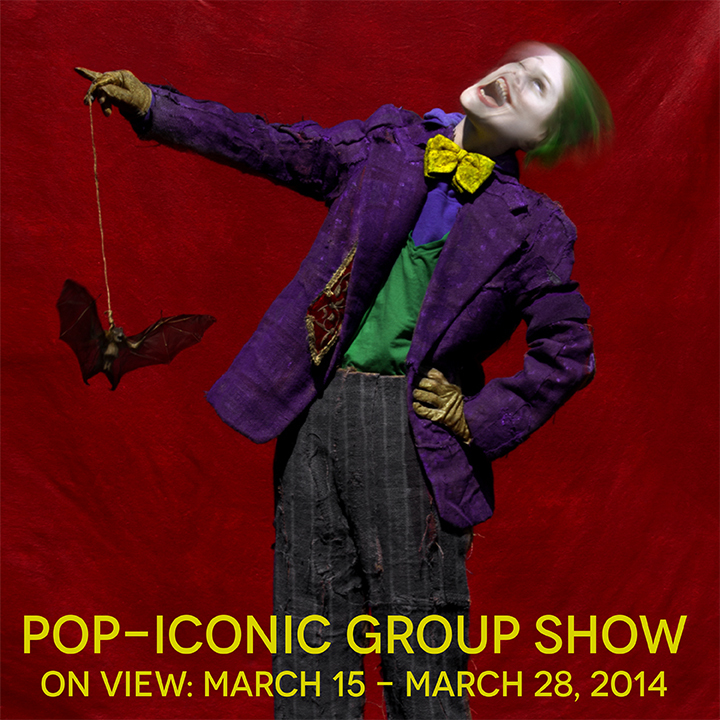 The 2014 group exhibition POP-Eyeconic: An Exploration of Iconic Pop Characters included art from 35 top contemporary artists. 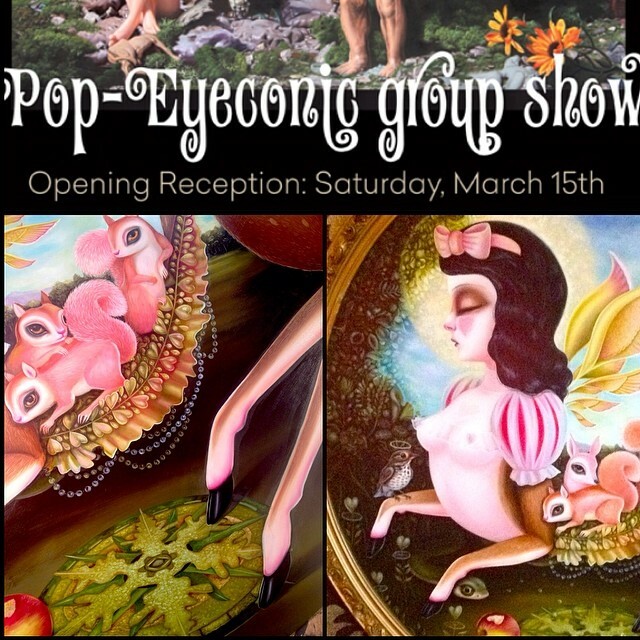 The opening reception was held on Saturday, March 15th 2014 and the exhibition ran until March 28. The artists rendered the icons that have meaning to them in their own particular style. 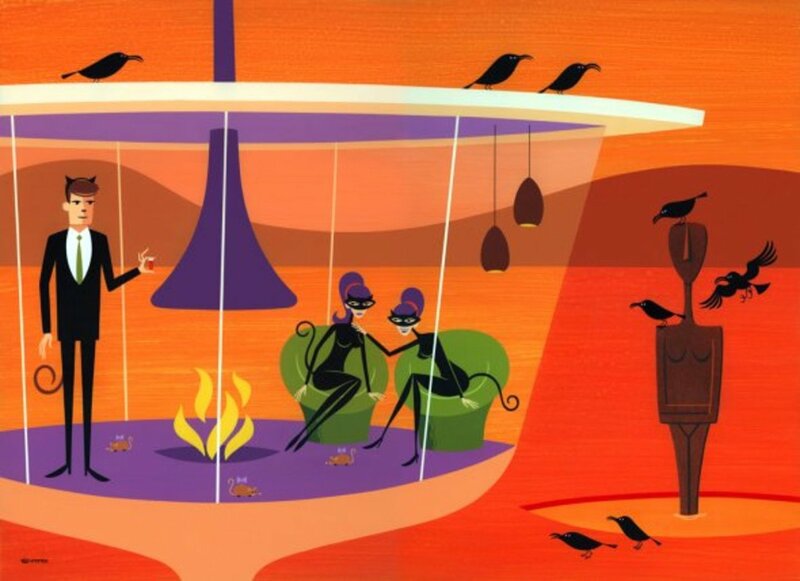 Shag submitted a study of Batman and Catwoman, The Purrfect Crime (sized 14” by 24”, cost $9,000 USD) to the exhibition. 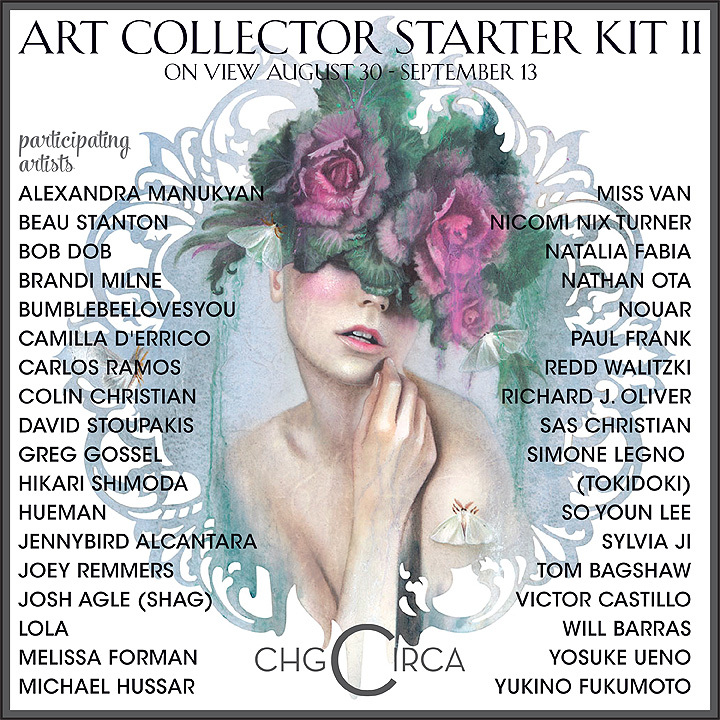 The second annual art collector starter kit group exhibition returned to CHG in 2014 from the 30th August to the 13th September. 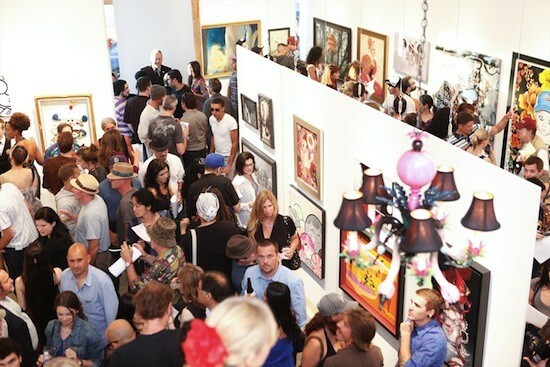 The provision of 12” by 12” works from new and established artists was aimed at attracting new art collectors. The acrylic on panel painting by Josh Agle is named Love, Brandy (sized 12” by 12”, cost $4,000 USD). 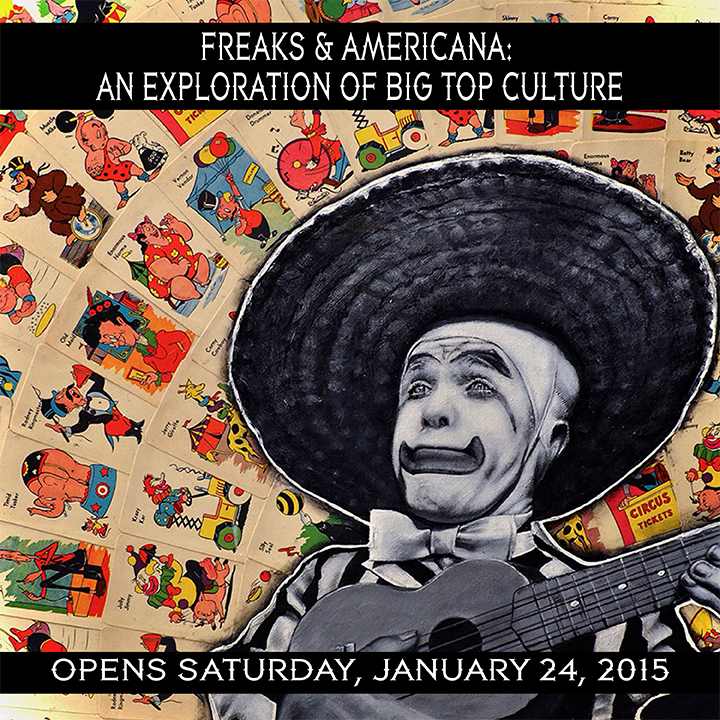 The Freaks and Americana exhibition ran from the 24th January to the 7th February 2015. 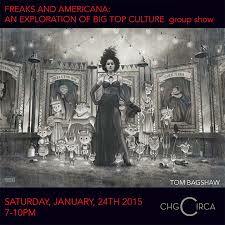 The group show explores Big Top culture in America, an outsider lifestyle of circus and carnival folk. Thirty-two artists contributed work including Josh Agle with his acrylic on panel painting Paternity (sized 17” by 20”, cost $9,000 USD). 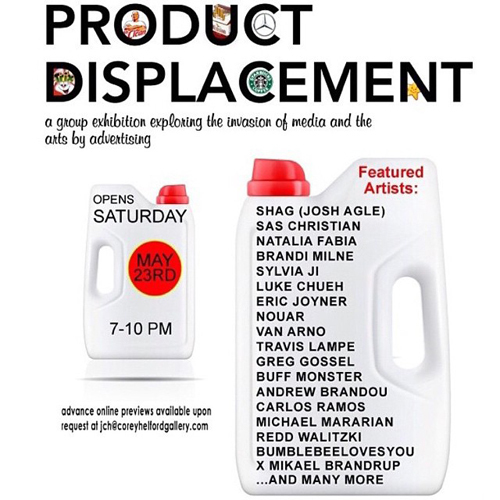 Product Displacement was a group exhibition exploring the invasion of media and the arts by advertising. It ran during 2015 from Saturday May 23rd through to July 18th. 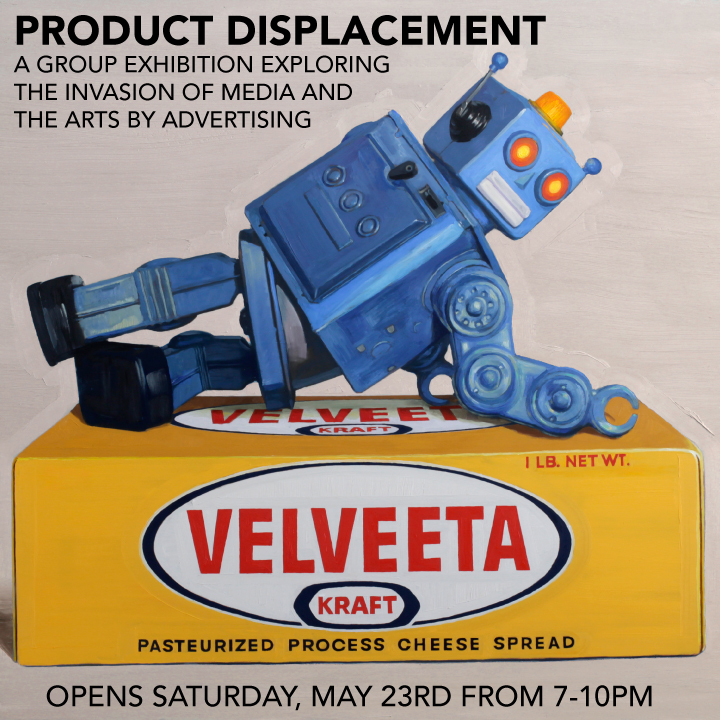 Twenty contemporary artists placed their work, making a statement about the interruption of the media and arts by the insertion of commercial advertising. Shag’s piece for this exhibition is the acrylic on panel painting Funny Face (sized 17″ by 22″, $11,000 USD). 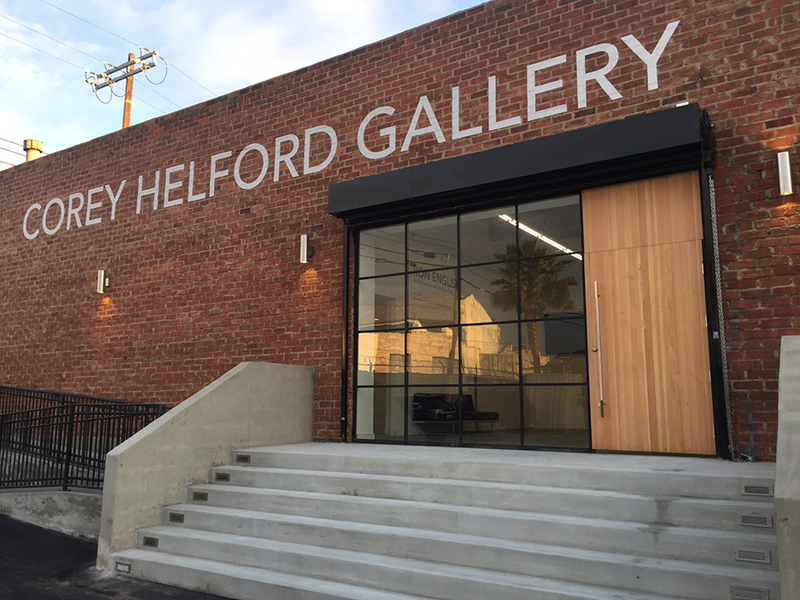 The Corey Helford Gallery successfully celebrated their first decade with a massive group show in their new twelve-thousand square foot space in downtown Los Angeles. 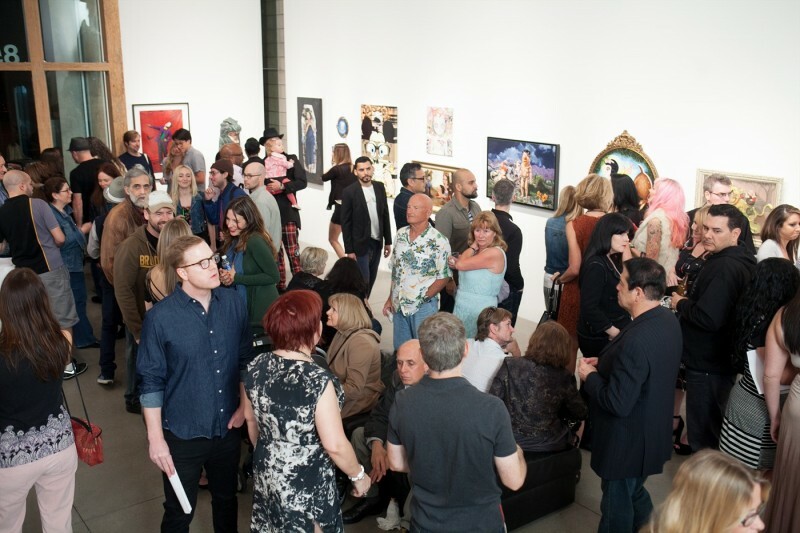 Over one hundred and thirty new works were shown from more than one hundred contemporary artists. The exhibition was held from the 27th August to the 24th September 2016. 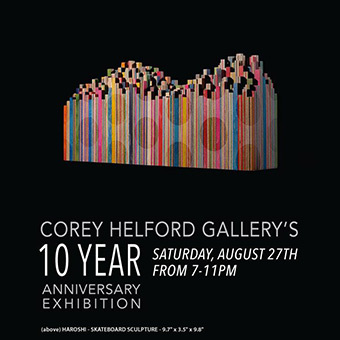 The exhibition was called Ten Years of Amazing Artists: Corey Helford Gallery and Friends Celebrate! and included the acrylic on panel original painting Five Wishes by Shag (sized 21” by 13”, cost $11,000 USD). 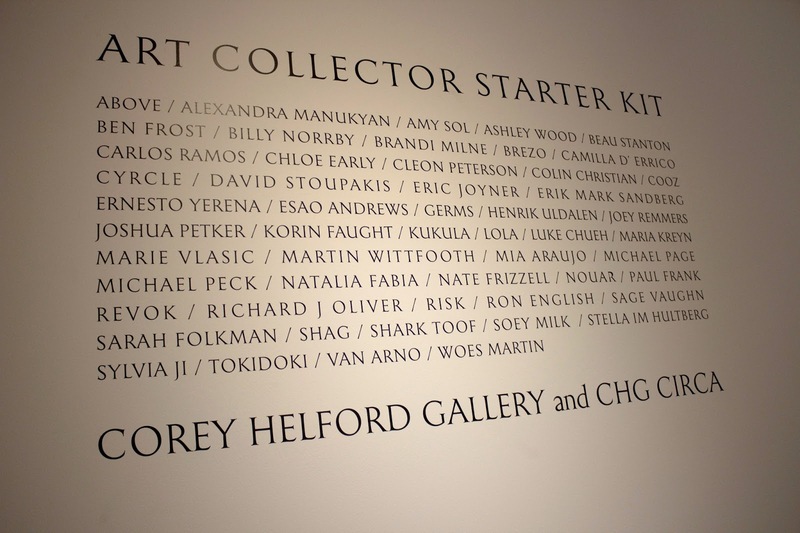 The fourth “annual” Art Collector Starter Kit Group Exhibition at CHG was held from April the 1st to the 29th, 2017. 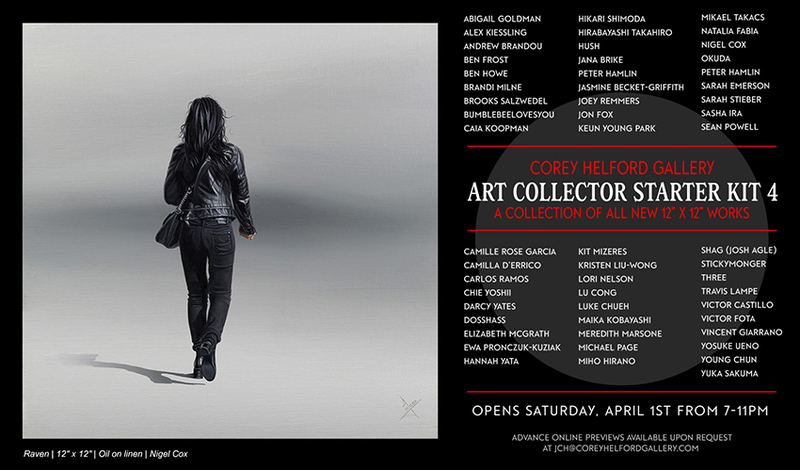 Over fifty artists were shown, each presenting an original 12” by 12” piece, more affordable for new collectors. 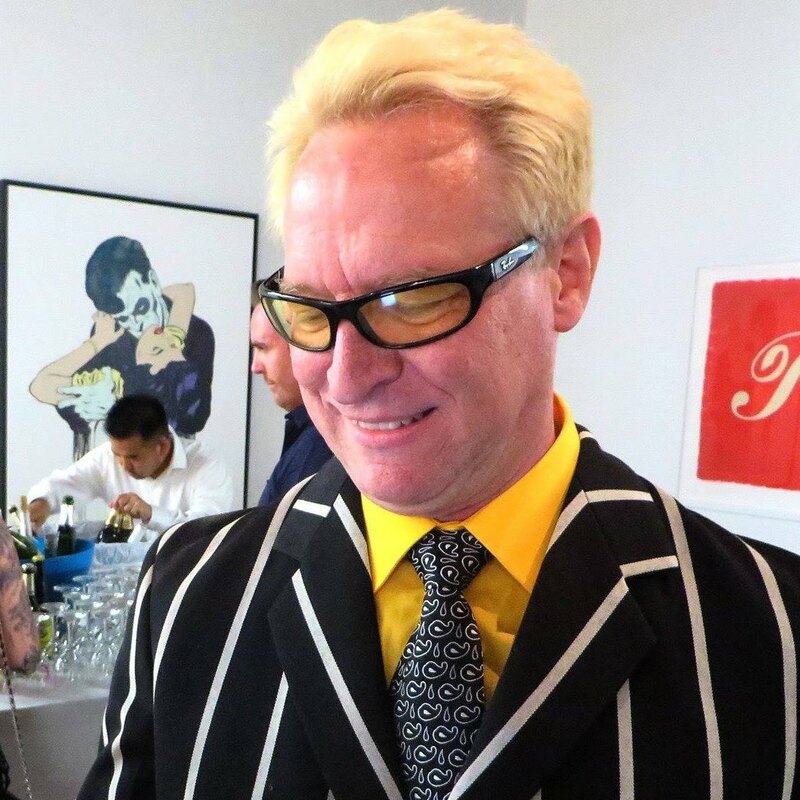 Attending this inclusive contemporary event was Josh Agle with his acrylic on panel painting The Man in the Brown Plaid Suit (sized unsurprisingly at 12” by 12”, cost $4,000). 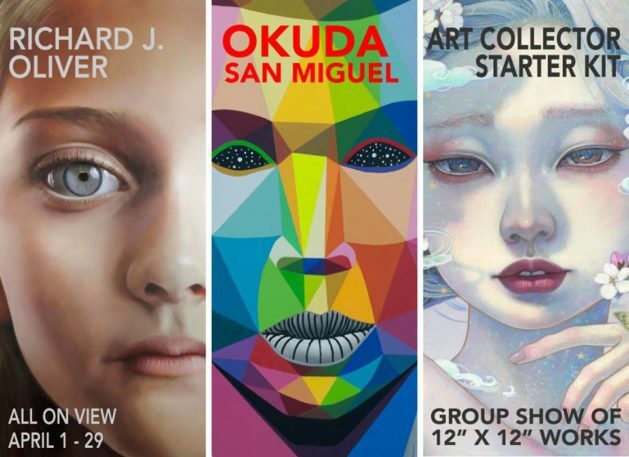 The fifth “annual” Art Collector Starter Kit Group Exhibition at CHG opens at 7-11pm on Saturday, December 1st 2018 and continues until December 28th. Artworks from over seventy artists are to be shown, each presenting an original 12” by 12” piece, priced for new collectors. Attending this inclusive contemporary event is Josh Agle with his acrylic on panel painting The Invideist (sized unsurprisingly at 12” by 12” and costing US$5,000).